The full programme for Ireland’s leading electronic music festival, Celtronic 2017, has been revealed. The festival, now in its 17th year, will see some of the biggest names in electronic music play at venues across Derry from Wednesday June 28 – Sunday July 2. The festival kicks off on Wednesday June 28 with a massive party at St Columb’s Hall with two of the most in-demand DJs in the world. Chicago’s finest THE Black Madonna will be back in Derry following a festival stealing performance in 2016 and will be joined by highly acclaimed Detroit DJ, Mike Servito and local heroes Deep Fried Funk DJs. 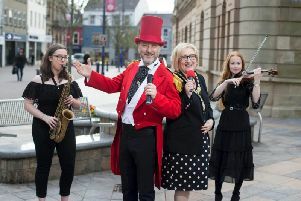 On Thursday June 29, BBC Radio Foyle will broadcast a special live show from Echo Echo Dance Studios featuring live performances and interviews with some of the acts playing at the festival. Later that evening, the stunning surroundings of The Guildhall will host a spectacular lineup of some of the best DJs in electronic music. The Nerve Centre is the location for the main event on Friday June 30 with Detroit legend Carl Craig joined by DFA records and LCD Soundsystem collaborator Sh!t Robot. The event will also see DJ sets from residents at local clubnights Jika Jika, Bekuz and Flux. Ryan Vail will play an intimate early evening show at Echo Echo Dance, Magazine St on Saturday July 1 that will feature tracks from his debut album For Every Silence and his soon to be released sophomore album. Celtronic 2017 returns to St Columb’s Hall later on Saturday night with a massive lineup that includes headline performances from one of the most significant names in global dance music, all-round creative dynamo and BPitch Control label manager, Ellen Allien and New York House don, Novel Sound’s Levon Vincent. The festival’s closing party will take place over two floors at The Gweedore/57, Waterloo St on Sunday July 2nd with Celtronic favourite Move D playing a three hour set alongside futuristic disco trio, Harvey Sutherland & Bermuda who will make the trip from Melbourne, Australia to perform their first ever Irish show at Celtronic 2017. Support comes from The Queen & Disco and Isodisco. Celtronic 2017 is supported by Derry City & Strabane District Council, Tourism Northern Ireland and PRS For Music Foundation. Tickets from Millennium Forum (028 71264455) and online at www.wegottickets.com.